Tonight at 7 p.m. will herald the wide release of J.J. Abrams' wildly-anticipated Star Trek movie. But while we're ticking down the hours, how 'bout revisiting the show that started it all: YouTube is hosting most of the episodes of the original Star Trek series. 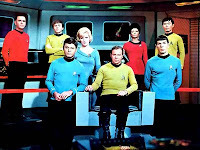 Among the classic episodes: "Amok Time" (Spock must return to Vulcan to satisfy his sexual urges or die trying), "Mirror, Mirror" (a transporter mishap sends Kirk and company to a twisted parallel world), "A Piece of the Action" (welcome to Sigma Iotia II: a planet inspired by Chicago gangsters! ), "Space Seed" (Kirk's first encounter with a certain 20th century warlord named Khan Noonien Singh), the always-hilarious "The Naked Time" (one of my personal favorites), "The Trouble with Tribbles" (MUST-viewing even if you're not a Star Trek fan) and "The City on the Edge of Forever", considered by many to be the finest single Star Trek story ever. Too bad YouTube doesn't currently have "Balance of Terror", 'cuz that would have been the perfect thing to watch going into the Star Trek movie, what with it being our introduction to the Romulans. But anyhoo, open comm channels, set phasers to "fun" and take in some vintage Star Trek! They've got "Mudd's Women" but not "I, Mudd"! Harcourt Fenton "Harry" Mudd was one of greatest Trek characters ever. We need all the shows with him! Just give him time. He'll probably come knocking sooner than later.